17" MacBook Pro. Not Big Enough? PR: Apple on Monday unveiled its new 17-inch MacBook Pro notebook computer featuring the Intel Core Duo processor and an all new system architecture that delivers up to five times the performance of the PowerBook G4. The new 17-inch MacBook Pro features a one inch thick aluminum enclosure (same thickness as the 15" MacBook Pro), weighing in at 6.8 pounds, and including a built-in iSight video camera for video conferencing on-the-go, and Apple's Front Row media experience with Apple Remote. The new 17-inch MacBook Pro also features the new MagSafe Power Adapter introduced with the 15" MacBook Pro. "The 17-inch MacBook Pro delivers the speed and screen area of a professional desktop system in the world's best notebook design," commented Philip Schiller, Apple's senior vice president of Worldwide Product Marketing. "With Intel's state of the art dual-core processor, the new 17-inch MacBook Pro delivers unrivaled performance in an innovative, sleek, one-inch thin design." The new 17-inch MacBook Pro features a 2.16 GHz Intel Core Duo processor that delivers dual-core performance in a power-efficient design, making it ideal for use in MacBook Pro's thin and lightweight design. Apple says the new 17-inch MacBook Pro is up to five times faster than the 17-inch PowerBook G4, "running industry standard benchmarks"* and offers an all new system architecture including a 667 MHz frontside bus that is four times as fast as the PowerBook G4 and 667 MHz DDR2 SDRAM memory expandable to 2 GB that is twice as fast as the PowerBook G4. Every new 17-inch MacBook Pro includes the same new feature set as the 15-inch MacBook Pro including a built-in iSight video camera. Every MacBook Pro also includes Photo Booth, Apple's application that lets users take quick snapshots with the built-in iSight video camera, add visual effects and share their pictures with the touch of a button. Featuring Apple's Front Row media experience, MacBook Pro gives customers a simple way to enjoy their digital lifestyle content including music, photos and videos from across the room using the Apple Remote. With Front Row, MacBook Pro customers can remotely access shared iTunesbplaylists, iPhoto libraries and video via Bonjour, Apple's zero configuration wireless networking built into Mac OS X. Every MacBook Pro comes with Apple's MagSafe Power Adapter, designed especially for mobile users that makes charging the notebook's battery easier than ever by magnetically coupling the power cord to the MacBook Pro. The MagSafe Power Adapter safely disconnects from the notebook when there is strain on the power cord, preventing the notebook from falling off its work surface. Every MacBook Pro also includes Apple's Sudden Motion Sensor that is designed to protect the hard drive in case of a fall. Designed for business and creative professionals, the new 17-inch MacBook Pro includes a 36 percent brighter display to make reading text and viewing images even easier and an ATI Mobility Radeon X1600 PCI Express graphics with 256 MB of dedicated GDDR3 graphics memory for demanding professional applications, and a Scrolling TrackPad to easily scroll through long web pages or pan across large photographs. Providing industry-leading connectivity and high-performance I/O, every new 17-inch MacBook Pro also includes a FireWire 800 port, a FireWire 400 port, three USB 2.0 ports, optical and digital audio input and output, built-in Bluetooth 2.0+EDR (Enhanced Data Rate), and integrated AirPort Extreme 54 Mbps 802.11g WiFi wireless networking. Every MacBook Pro includes iLife '06, the next generation of Apple's suite of digital lifestyle applications featuring iPhoto, iMovie HD, iDVD, GarageBand and iWeb, a new iLife application that makes it super-easy to create amazing websites with photos, blogs and Podcasts and publish them on .mac for viewing by anyone on the Internet with just a single click. 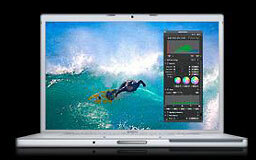 All the iLife '06 applications run natively on the new Intel-based MacBook Pros for maximum performance. Every MacBook Pro also comes with the latest release of Mac OS X version 10.4.6 "Tiger" including Safari, Mail, iCal, iChat AV, Front Row and Photo Booth, running natively on Apple's Intel-based notebook line. Mac OS X Tiger includes the Rosetta software emulation technology called that lets users run most Mac OS X PowerPC applications seamlessly. Intel-based Mac customers also now have more than 1,500 Universal Binary applications to choose from and the list is growing each day with developers including Adobe, Quark and IBM's Lotus division announcing support for Mac OS X Intel-based applications. An updated list of Universal applications for Mac OS X is available at guide.apple.com/universal . The new 17-inch MacBook Pro will begin shipping next week through the Apple Store, Apple's retail stores, and Apple Authorized Resellers. Additional build-to-order options for the 17-inch MacBook Pro include 100 GB (7200 rpm) hard drive, up to 2 GB DDR2 SDRAM, Apple USB Modem, and the AppleCare Protection Plan. *Based on estimated results of industry-standard SPECint and SPECfp rate tests. SPEC is a registered trademark of Standard Performance Evaluation Corporation (SPEC); see http://www.apple.com/macbookpro for more information. **Actual speed will vary based on range from the base station, environmental conditions and other factors. See http://www.apple.com/rosetta/ for information on Rosetta supported Apple software. Contact the manufacturer directly for 3rd party software. "Apple has released its latest PowerBook (sorry, MacBook Pro!). "Powered by a dual-core Intel processor, it runs up to five times the speed of a PowerBook G4 and has eight times the graphics bandwidth. It's got a built-in webcam, a higher resolution screen and it weighs just over 3kg. "So how come I'm not desperate to replace my two year-old 17" 1.33 MHz [sic] PowerBook? "Partly it is because Adobe aren't going to be releasing their Intel-optimised applications until next year. "Partly it is because my current PowerBook is plenty fast enough for most situations (and, yes, I know that if I actually tried one of the new 'Books I would probably change my tune on that one). "But mainly it's because I would have liked it to have been just that bit bigger!" Link: 17" MacBook Pro. Not Big Enough? "I can deal with the fact that the 17-inch MacBook Pro has some features that the 15-inch model doesn't have (FireWire 800, 8x double-layer burner) but I am baffled by Apple's pricing model for the MBP17 nicknamed "riot shield." "...if you Configure To Order (CTO) the MBP15 with the 2.16 GHz processor (+US$300) and switch to the 120 GB HDD (same price) to match specs with the MBP17, the 17-inch model is actually US$100 cheaper than the 15-inch. So for US$100 less you get a MacBook Pro with a 17-inch display, FireWire 800 and an 8x double-layer SuperDrive. Huh?" "I've been a Mac laptop fan since Carol's first PowerBook 100 back in the early 90s. 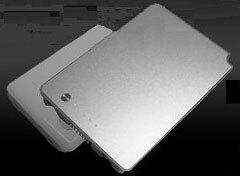 The aluminum PowerBooks were nearly perfect. "No, the 17-inch becomes the ultimate because of the sum of the parts. I carried around one of the original 17-inch aluminum PowerBooks for well over three years, so I'm familiar with the bulk. "Frankly, it's not that bad. Add a good case with a strong strap, and you're good to go. Literally. When you compare a 15-inch model to a 17-inch model, there's just a couple of inches difference, and that doesn't add up to much. "The big difference is the screen. It's real estate. It's what makes up your Mac. It's where OS X resides. More is better. Size matters. "Once you've used a 17-inch Mac screen, anything smaller is, well, it's just smaller." "At this price it's likely to cannibalise sales of the top-of-the-range 15-inch MacBook Pro...."
PR: FastMac has announced a full line of affordable TruePower Apple laptop batteries. The new high capacity batteries are available for: PowerBook G4 (Titanium and Aluminum), iBook (all models), and PowerBook G3 (Wallstreet, Lombard, and Pismo). The TruePower batteries start at an introductory price of $99.95 and offer up to 56% more capacity than the original. Select models will begin shipping in the next two weeks and are now available for preorder on the FastMac site. "We're excited to be the first to offer a high quality and high capacity battery for under $100," said Michael Lowdermilk, Business Development Manager for FastMac Performance Upgrades, Inc. "Whether your original battery just won't hold a charge or you need an extra, this is the perfect match for your laptop." The TruePower batteries make use of the highest quality and capacity Lithium cells available. FastMac also utilizes custom form factors and color matching techniques for each battery model to ensure an exact fit and look to Apple specifications. Each battery is individually tested and includes safety features to protect against overcharge, short circuit, and power surges. All TruePower laptop batteries come with a 1 year warranty and 30 day money back guaranty. PR: BOOQ, maker of premium brand performance-driven laptop carrying cases for creative professionals on the move, announces the addition of Vyper XL2, a compact and durable laptop sleeve perfectly fitted for the 17-inch MacBook Pro. Perfectly fitted for the 17-inch MacBook Pro, Vyper XL2 is a compact and durable sleeve with a slick, rugged exterior and a non-scratch interior designed to protect your laptop against scratches and excessive wear. Although Vyper does not have a handle, it can be used on its own, but it is designed to be used first and foremost as additional protection inside another bag, like our Boa, BP3, or Python backpacks. Booq have sandwiched durable, semi-rigid high density foam between a layer of 1682D cross-weave ballistic nylon on the exterior and a super non-scratch lining on the interior - an effective blend. Vyper XL2 easily slips into a larger bag; its rugged exterior and non-scratch interior are designed to protect the MacBook Pro against scratches and excessive wear. Priced at $59.95, creative pros who prefer a well-designed and compact sleeve will find the Vyper XL2 a must-have for their 17-inch MacBook. Exterior Dimensions: 16.4 x 11.4 x 1.5"
With the addition of the Vyper XL2, BOOQ brings another premium sleeve of the highest performance to the next generation of creative professionals. Customers who have come to expect fresh and innovative design solutions love the exceptional level of quality and functionality of BOOQ's products. The privately held company is based in Sierra Madre, California. 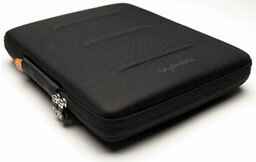 The Vyper XL2 will ship June 5th, 2006. PR: FirmTek, LLC, a pioneer and leader in Serial ATA (SATA) storage solutions for the Macintosh platform, today unveiled at NAB 2006 (Booth SL 1238) their new SeriTek/2SM2-E, a Serial ATA ExpressCard host adapter. The SeriTek/2SM2-E extends SATA's astounding performance beyond the desktop, enabling content producers to capture, develop, edit and create content in almost any environment when using Apple's new MacBook Pro notebook computers. With transfer rates up to 3 gigabits per second per port, this breakthrough solution sets a new standard for handling data in a remote setting. FirmTek's established hot-swap compatibility also makes it easy for users to move entire drives and arrays from the MacBook Pro to any FirmTek-equipped desktop system in seconds. With the arrival of the MacBook Pro earlier this year, Apple introduced its first systems utilizing ExpressCard, the industry's follow-up to the long-established PC Card standard that is now considered too sluggish for the latest needs of media professionals. With nearly double the throughput of PC Cards, the ExpressCard standard will allow notebooks to support applications involving HD video and other demanding content and creativity. FirmTek's SeriTek/2SM2-E is the first ExpressCard solution announced supporting SATA drives and enclosures. FirmTek has pioneered ATA standards on the Macintosh for many years, and markets a variety of enclosures and interface solutions for demanding users. Since the introduction of SATA, the ability to hot-swap drives between enclosures has been a key feature across FirmTek's solutions, and this benefit is more pronounced than ever with the SeriTek/2SM2-E. Now videographers, editors and other content creators can work in the field, using a compact and easily portable two-drive enclosure and as many drives as they choose to carry. Once back in the office volumes are easily moved to any desktop systems in the time it takes to move a drive tray from one enclosure to another, usually just a minute or less. This flexibility allows users to share important data quickly, transfer or duplicate files at the speed of SATA (instead of over sluggish networks or Internet connections), and to keep more sensitive files locked up and secure with minimal effort. To assist customers in maximizing their productivity and obtaining maximum benefit from their FirmTek solutions, FirmTek offers additional drive trays for $22.99 each, without any additional purchases required. This enables customers to keep an unlimited number of drives on hand and ready for action. FirmTek's SeriTek/2SM2-E ExpressCard adapter for the Macintosh will be available early Q3 this year, with estimated retail pricing of $119.95. PR: Finally, iBook users can get maximum wireless - without any wires! For $199.95 iBook Connect from QuickerTek not only delivers up to five times the standard wireless performance adding an external antenna, but also eliminates the tangle of wires and brain-surgery internal connections that other wireless solutions demand. Continuing the theme of use-of-use that iBook users enjoy, iBook Connect is a truly wireless solution that only needs a web browser for setup. It easily connect AirPort and AirPort Extreme networks without disassembling the iBook, maintaining AppleCare. iBook Connect is powered from either a USB connection or AC adapter. For those who demand complete mobility there a iBook Connect with an internal battery ($229.95 ). Either iBook Connect model can be attached to the iBook case or it simply rests on the desk. 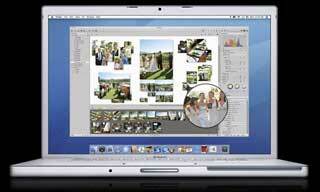 You connect to wireless networks just like using a standard iBook. iBook Connect operates between the internal AirPort card and the access point (commonly an AirPort Base Station), and amplifies wireless signals going in and out of the iBook. So, the iBook Connect can link your land Internet connection to your offshore boat. While the functionality of the Apple AirPort Express and the iBook Connect appear similar, they are very different in terms of capability and performance. AirPort Express has a smaller buffer which limits wireless performance. AirPort Express can only be powered from AC adapter which severely limits mobility. iBook Connect accepts a variety of external antennas, unlike the AirPort Express where you don't have to have access to the RF port connector. iMac Connect generates four to five times more RF output and has a more sensitive receiver than the AirPort Express. Changing wireless networks requires additional work which breaks the ease-of-use mandate Mac users expect. iBook Connect eliminates each of these limitations and works on all 802.11b/g wireless networks, Mac or Windows. Generating five times the standard wireless range of the iBook is made possible with a 200 milliwatt antenna. RF power is the rating for wireless products. A stock iBook has about 30 milliwatts of RF power. Improving the RF rating from 30 to 200 milliwatts is what gives you that extra wireless range and speed. You also can use any popular wireless network hardware include access points from LinkSys, Belkin, dLink and of course, Apple AirPort and AirPort Extreme Base Stations. That means just about any 802.11b or 802.11g networks and your Mac OS X or later operating system. You can even move your iBook Connect to any other WiFi-ready computer - Mac or Windows. QuickerTek's iBook Connect combines a more powerful 2dBi antenna with a design that does not require opening the iBook. Later, when you want even more power, you can add one of QuickerTek's many high power antennas. Like most QuickerTek products, it's backed with a one-year warranty on parts and labor. QuickerTek has been a recognized leading innovator of antennas and RF products for Apple Power Macintosh, iMac, PowerBook, iBook and MacBook Pro computers. QuickerTek products can be purchased online and from authorized dealers. TheftSensor is a brand new application that makes it easy and fun to protect your MacBook. Simply press the play button on your Apple Remote and TheftSensor will be activated. From now on, moving your Mac will trigger a loud alert. Pressing the mute button won't help a potential thief as TheftSensor disables it. The same goes for closing the MacBook's lid: this will trigger the alert as well. Of course, you can still use your MacBook without launching the alert: simply press the play button again to disable the alert. View the video and see TheftSensor in action. Or - if you are lucky enough to own a MacBook - download the free public beta. TheftSensor is a great tool for MacBook owners and it can be very useful in many situations (dorm rooms, libraries, at work, ...). However, when travelling, your Mac will in most cases be sleeping or even turned off. Even if you could leave it on while travelling, a solution like TheftSensor is not useful as the alarm would go off every few minutes. That's why we developed Undercover, a full featured theft-recovery application that features built-in iSight support as well as many other innovative features, such as the ability to totally block your stolen Mac. What if a thief closes the lid? The alert will go off when closing the lid (if TheftSensor is enabled). What about the mute button? What if a thief uses his own Apple Remote to turn off TheftSensor? You can pair your Apple Remote with your computer, so that only your remote can be used to control it. More information on this can be found on the Apple website. Is TheftSensor also available for other Mac laptops? Does this beta have any limitations? No, there is no nag screen or expiration date. PR: MiniBatteryStatus is a small Dashboard widget that monitors battery status, charge percentage and remaining battery life. Integrated with Growl to alert you when it's time to recharge your battery. MiniBatteryStatus widget monitors battery status and charge percentage. It displays colorful information to quickly notice your battery conditions. The widget assumes different colors depending on the remaining charge of the battery. It is also aware of battery charging and plugged status. User can choose if the widget should display percentage, remaining time, capacity (current/maximum) and cycle count or just the charge gauge. MiniBatteryStatus is definitely a must have for all Tiger-powered iBooks and PowerBooks out there! And since MiniBatteryStatus is a Universal Binary application, you can even run it on your brand new MacBook Pro! Growl integration. Be aware of what happens to your battery even when you're not looking at Dashboard. MiniBatteryStatus tells you when it's time to recharge your battery and when you're done charging by Growl notifications. Universal Binary. You can run MiniBatteryStatus on both PowerPC iBooks and PowerBooks and Intel MacBook Pro's. Lots of colors. Widget color varies with continuity from green to red. Enjoy a plenty of awesome nuances from acid green to coral red. Smaller widget size to save Dashboard real estate. iBooks and PowerBooks have limited desktop surface. Leave room to other cumbersome widgets, still monitoring your battery with style and no clutter. Less bother with registration reminders.